Just a quick note to say sorry things have been a bit quiet around here, and to apologise in advance for the fact it’s likely to stay that way for another couple of weeks. If it’s any excuse I’m in the midst of something of a perfect storm of work and personal commitments (we moved house last Monday, and my partner is about to give birth to our second child in the next couple of days. And I’m still working at the Uni and have a book to finish, as well as all my normal freelance work, so it really is all a bit silly at present). But with a bit of luck I’ll get a few things up in the next little bit and then get back to posting properly in December. In the meantime I’ll offer you three little tidbits from the last week. The first is the fact that while I was listening to a lecture about Flannery O’Connor the other day I realized that since she was only 39 when she died in 1964, she’d only be 84 if she were still alive today, which is not that much older than Philip Roth (76), Cormac McCarthy (76), Shirley Hazzard (78) or David Malouf (75) all of whom are not just alive but at the peak of their powers. So if O’Connor hadn’t died young there’s a good chance she’d still be writing, and even if she wasn’t she would have been until very recently. Which is strange, at least to me, since in my mind she’s very much a writer of the mid-20th century, and not the 21st. The second is this broadcast about intelligent bacteria from the ABC’s All in the Mind program, which is very definitely worth a listen. I’ve long been aware of evidence that colonies of bacteria seem to possess organizational abilities beyond what we’d expect of individual bacteria, but I had never run across the suggestion that they themselves might be intelligent, either collectively or individually, so the talk of nanobrains in the program was exciting stuff. Want a refocussing of your perspective on the place of humans in the universe? I reckon this might be a place to start. 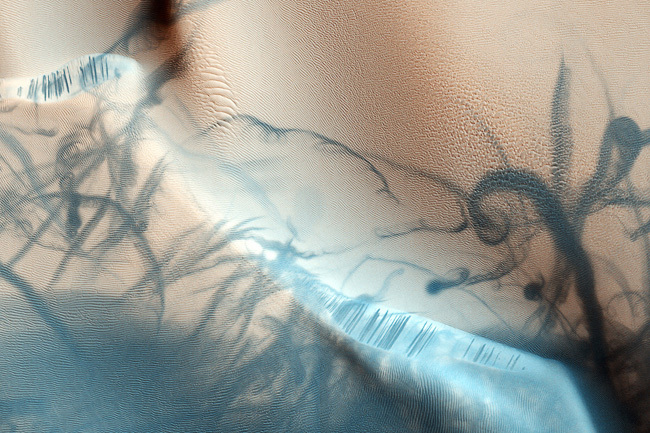 And finally there’s this rather magnificent gallery of images of the Martian surface. You can see black basalt sanddunes, organically curling dust devil tracks and the tracks of the Rovers, and while I’m a bit of a Mars tragic, it’s wonderful, almost painfully beautiful stuff. If you want to see more you might want to check out The University of Arizona at Tucson’s High Resolution Imaging Science Experiment.